Welcome to another week of Monday Musings. Victory Bell -- it's a Duke thing. Hey Blue Devil Nation! Yall are feeling good out there after Duke Football pushed their record to 4-0 with a win over arch rival North Carolina this past Saturday. Of course, that means the Victory Bell will remain in Durham, so lets take a look at how and when to enjoy the moment. Firstly, the Victory Bell is the gift that keeps on giving. What I mean by that is it plays well all year. There are of course bragging rights and as David Cutcliffe likes to refer as grocery store wars. It is a known fact that one team color or another appears the following Sunday with concern to which blue wins. But where the rivalry trophy helps most is in recruiting. Duke Football has now won 15 of their last 18 games against opponents from the state of North Carolina. In fact, of the Tar Heels last six games played, the Blue Devils have defeated them twice. This means that the bell hangs around in Durham for better than a year now or longer. The bell will be in the Bryan Center on the Duke Campus today, so go over and give it a ring while visiting the bookstore. While at the bookstore, buy you a shiny new Duke Football shirt. You will need that to wear at the Miami game this Friday night. But, Monday is not only for musings. It is about letting go at the end of the day. 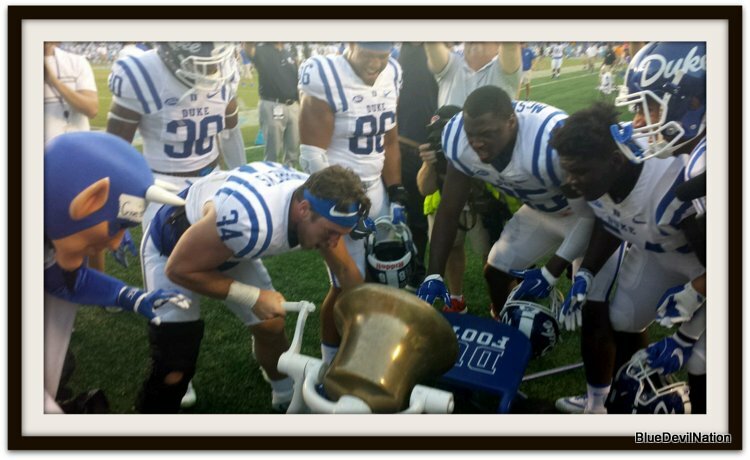 Duke fans and team alike has to play it forward for we can all come back and see the bell once more work is done. 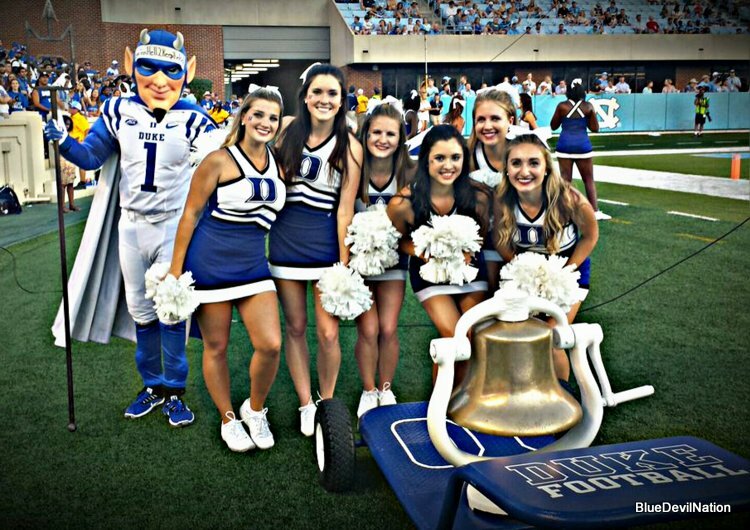 Of course, Duke fans will in no way be opposed to hearing the bell ring this Friday evening in a game nationally televised on ESPN. Heck, maybe Duke should offer each fan a ring who buys a ticker between now and then with a promotion. The president, AD and Cut. We all know that Duke ended the first half on a bad note where they could have had a mildly commanding lead. Instead, the teams were tied at the half after two long Tar Heel completions after a botched field goal. UNC would take the lead in the 2nd half as their sideline was seen going nuts. Heck, you can't blame them for they certainly have had injuries and such. But when the Tar Heels were celebrating, the Duke sidelines were quiet. No, not moping and such, but quiet in a confident way. While the Blue Devils struggled a bit with the passing game, the running game showed up again. 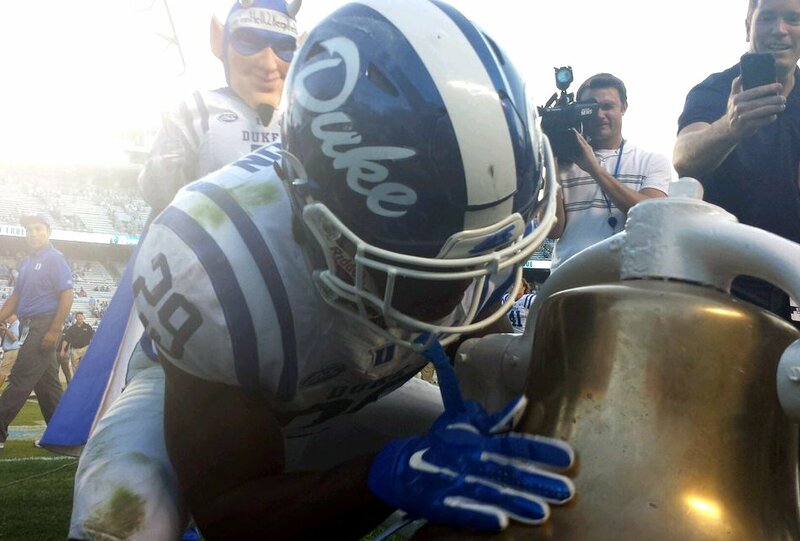 Duke goes to 4-0 and owns the Victory Bell after a 27-17 win over North Carolina. 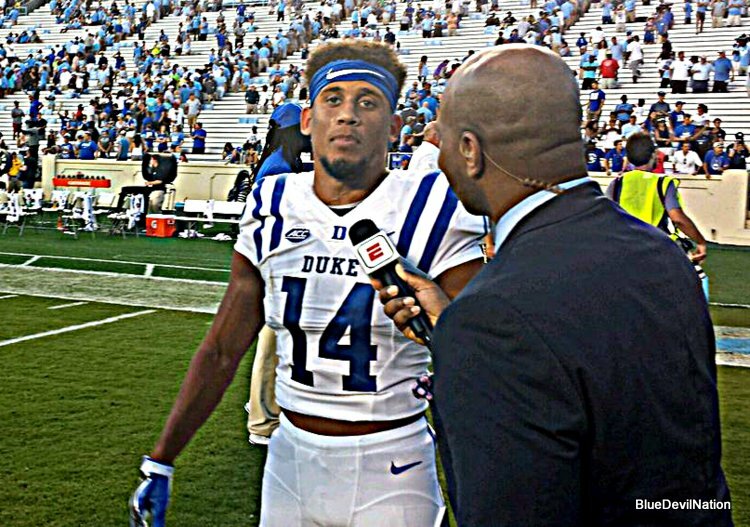 Shaun Wilson gave Duke the lead where he had to enter the end zone twice and those would be the winning points. But the Tar Heels were driving when senior leader "Call me Mr. Fields" broke on the ball for a long heartbreaking interception for a touchdown for those in Carolina Blue. Duke fans were seen being giddy and the cheerleaders animated in what seemed like a slow motion play. Oh, and there were some key blocks which made the run possible as well. After sitting in a scorching sun all day long, Blue Devil faithful were a happy bunch. The scene on the sidelines was of course, nice. 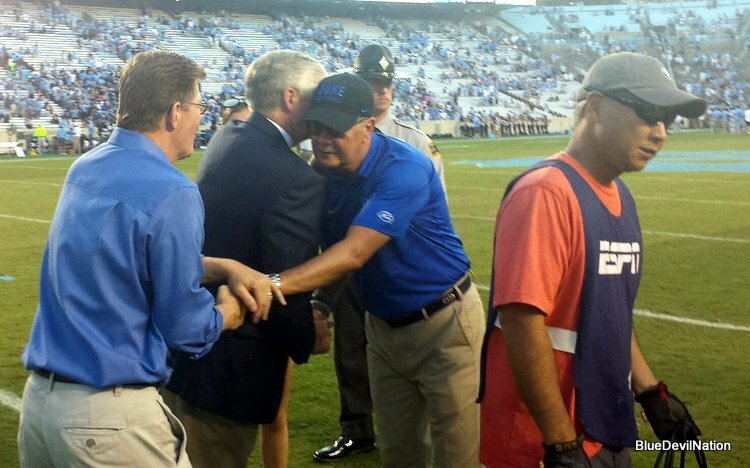 Duke University president Vincent Price and athletic director Kevin White were on the sidelines having come down from their seats. They were see congratulating David Cutcliffe on his milestone 100th victory as a coach. Call me Mr. Fields or the heart breaker. Cutcliffe would then hug on his daughter as ESPNU interviewed him in the post game. Bryon Fields would mug for the cameras as well as the player of the game. Some Blue Devils came over to ring the bell as they came off the field. Injured linebacker, Ben Humphreys was one of the first where he seemingly clanged out his frustration after what looked to be an intentional chop block set up on him as time wound down. But most of the Blue Devils went straight to the locker room and players would soon follow with the bell. They didn't run it in the faces of their opponents but ones inside the locker room, you heard plenty of joy from a key win. Duke will now take on a highly rated Miami team picked to win the Coastal Division. And they are loaded with speed and talent, trust me on that. The Blue Devils have to put the UNC win in their rear mirror for they have a short week of preparation. Heck, Cutcliffe and his staff have just two games to watch video on the Hurricanes in that games were cancelled due to the weather. This means Miami will be quite fresh and itchy to play more football. Duke has places 27th in the country in both polls this week and an upset win would land them in the rankings. The Blue Devils are offering Durham residents discounted tickets and the team not only needs, but deserves your support. This is a big time game on a Friday evening which gives fans Saturday off. I will see you on Friday.